Last week I posted my review of the Fortress of Winds dungeon in The Minish Cap and mentioned briefly how I loved the change of pace this moment provided, but I thought I could expand on it a bit. In particular, I noticed that in the comments of that review, a lot of people said they were mad that the Wind Element wasn’t found in that dungeon, and that really confuses me. Take it from my perspective: When I first heard about The Minish Cap, I was rather excited to play it. Its sprite visuals were really colorful and quite beautiful. The villain was a new, humanoid form of Vaati. It just looked really fun. But I had one major concern: It looked short. Its formula appeared to be… collect four elements… confront Vaati. So at most, four to five dungeons. People complain fairly often about how formulaic Zelda games can be, especially in terms of the “acquire three things, plot twist, acquire three more things” trend that recent games follow. I have no idea if gripes about that trend are really that prevalent, but they’re common enough that I hear them often. Even when they don’t follow that formula specifically, most Zelda games set up their own formula, which they follow strictly. Take for example how Majora’s Mask’s formula is collecting the remains from the four dungeons to awaken the Giants. I thought The Minish Cap was going to be exactly like that, but it broke its own formula. What! How dare the game take this moment from me! I earned that Wind Element! I trudged through Castor Wilds to get here! I braved the Wind Ruins and the Fortress of Winds! I defeated Mazaal! I went through that entire freaking Pegasus Boots quest to stand here and hold that element in my hands! Well… yeah. But you’re rewarded the same as you are for any other dungeon, and in fact you’re rewarded better. 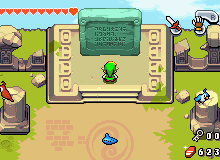 It’s rare that a quest item in a Zelda game rewards you in terms of gameplay options like other items do, and while I guess they do in The Minish Cap since they let you create more copies of Link, you’re given the Ocarina of Wind for your troubles, and you get the same prize for beating a dungeon that you always get in any Zelda game: Advancement of the story. And on top of that, it added more length to the game. It was an excuse to add another dungeon to the lineup, as was the Royal Tomb later in the game (short though that was). I’m not saying the formulas established in other Zelda games are necessarily all bad, but some people do complain about them, and with that in mind, I’d have thought this moment would be far more loved than it seems it may have been. Depriving the player of the Wind Element in the Fortress of Winds granted the player an extra dungeon, a longer game, more story, a cool change of pace, a break in static formula, and above all, a neat moment that expanded the lore of the Wind Tribe and created a sense of mystery. Completing the Fortress of Winds and expecting something normal, but getting met with this odd and mysterious moment, with enigmatic hints about the Wind Tribe as you look over the horizon in a shrine covered in birds to beautiful music, was a really cool moment and I enjoyed it a lot. So how about you? Did you enjoy the length and mystery this moment added to the game like I did? Were you glad for its inclusion in the game? Or were you one of those people who got mad at it not being there? If so, why was that? Tell me in the comments!